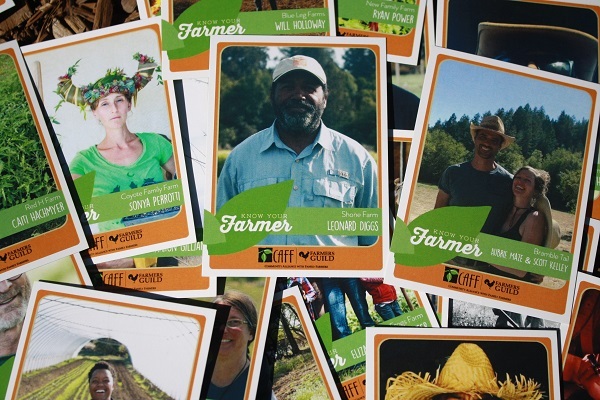 In August, CAFF/The Farmers Guild premiered brand-spanking-new farmer trading cards at the Gravenstein Apple Fair. We talked to Evan Wiig, director of membership and communications, for the stats on the farmer advocacy organization’s venture into “sports” territory. Why did CAFF/Farmers Guild decide to make farmer trading cards in the style of traditional baseball cards? People idolize athletes, so much so that they put them on trading cards to follow their stats, and sometimes even pay ridiculous amounts of money for them. Well, we think farmers are just as worthy of reverence as any baseball player. So we decided to give them the same treatment, showcasing all the hardworking people behind our food, pulling off their own amazing feats in the field, so often undervalued in our society. This is a way for us to place our heroes among the echelons of Babe Ruth and Stephen Curry. They make great gifts, and kids love them. At the Gravenstein Apple Fair, I watched a local farmer exchanging cards with an excited bunch of children, all haggling for their favorites. The looks on their faces when they realized the farmer before them was featured on one of the cards was priceless! As if they were suddenly in the presence of a celebrity! And they were. Grab a deck and see how many cards you can get autographed! How many decks were printed? The first run was about 150 decks, with 22 cards in each. We’ll be posting up at various events this holiday season, including farmers’ markets, fairs, etc. Just look for “CAFF & The Farmers Guild.” A few of the featured farmers also have a stack of cards they might sell ya if you find them at the farmers’ market. Absolutely. Not only do we hope to print another series featuring all of the great Sonoma County farmers and ranchers we missed the first time around, but we also hope to print decks featuring farmers from other counties. A deck for every county in California? Life goal. Any other takeaways from this project? It has people thinking about where our society places farmers when it comes to the hierarchy of prestige. We pay doctors and lawyers big salaries. We bestow actors stars on the Hollywood sidewalk. And we’ll even ask for recommendations before selecting a mechanic to change our oil. Yet most people never even ask who grew their food—let alone crowd around when they place their handprints in cement. God knows, we don’t pay them enough. These cards are just one push in the right direction. If we care about our food and the land on which it grows, we can’t allow the people behind it to remain anonymous. I hope kids will start looking up to farmers so we can lure the best and brightest from the new generation towards the most vital and profound vocation there is. 1. Wrap holiday gifts in good quality linens or cloth napkins. 2. Reuse holiday cards: Buy cards with sheets that can be written on and then peeled off, leaving the card shell to be reused. 3. Gift food in mason jars.